Eid is just around the corner. Even though we as a nation is still mourn the lost of our people on flight MH17, life still goes on. I am a little bit heartbroken with all the madness and the inhumanity happening all around. I just don't get it. Anyway, today I would like to talk about apps. 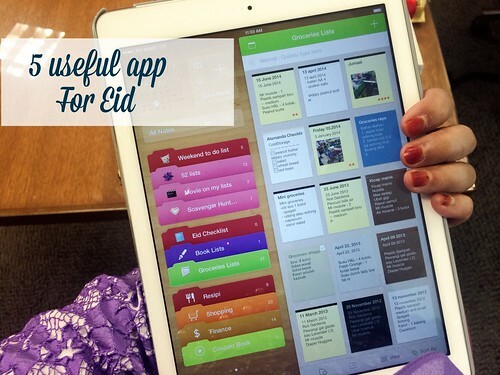 Mostly about apps that can help you in preparation for Eid or during Eid. And these are the apps that I've used over and over again over the years and there's new app that I like to try just because it is fun to try. I still used Awesome Note after all these years. I still think Awesome Note should be the default note taking apps for your iPad or iPhone. You can create a category specifically for Eid and it's a good place to write your do lists and your checklists. And this app look beautiful in iOS 7. If you are a blogger than this app is for you. Since you will be gone for about a week, it is a good idea to plan ahead your blog posts. BlogPress is also available in iPhone and iPad, so that means you can blog about your random photos and stories on the go. This is also one of the earliest app I bought that I am still using. I just love this app for mobile blogging. The most useful app ever especially during visiting family and friends at a place where you are not familiar with and have to idea what the traffic look like. Waze can help you find the best route, estimate your time of arrival and show traffic. Don't leave home without it. A free app from Evernote to keep track of food. During this festive season you need an app like Evernote Food to keep a journal what kind of food you eat in one day. Sometimes we tend to eat more that we shoot during Eid, which is not so good for your health and your weight. And this app integrate with Evernote. That makes it more accessible to you on any devices. You can also keep your recipes and collect all the recipes you want to try in this beautiful app. Emma and Elsie did it again. Another beautiful app from these two talented ladies - Party Party! It's a beautiful camera apps. I just got this app and I am already loving it. Get this app if you love Photo Booth style photo and a little bit of animation / gif format. And this is a camera app not photo editing app.